This question is ever more pressing, as the present-day Europe wallows in crisis – its deepest since the process of European integration took off in the 1950’s. Over the last years the debate about Europe’s future has become the property of politicians and economists. What if the answers to Europe’s most burning questions lie not in politics or diplomacy, but in art and culture? With this question in mind we decided to organize Re:Creating Europe, the first Forum on European Culture, to discuss Europe’s fundaments and future. On June 1-3 2016 more than 200 artists and thinkers from all over Europe and beyond came to join us in Amsterdam. Together they explored the role, value and impact of art and culture for Europe – in the past, present and future. The days of the forum were filled with thrilling ideas, heated debates and unexpected encounters during which artists and thinkers engaged in the paradoxes and puzzles of European identity and culture. Re:Creating Europe took shape in a programme of debates, performances, lectures, film screenings, exhibitions and expert sessions. Highlights were, among many more, a 12-hour marathon interview conducted by Rem Koolhaas, a cutting-edge theatre performance directed by Ivo van Hove with Europe’s most talented actors, a theatrical journey through Europe’s history by writer György Konrád and theatre maker Marjolijn van Heemstra and an exploration of Europe’s cultural frontiers with young visual artists from the so-called “edges” of our continent. We are more than honoured that so many thinkers and artists joined us on this quest. Without their enthusiasm, curiosity, ideas and visions this forum would never have been possible. As historian Mathieu Segers said during the opening of the forum: ‘The make-believe of pure rational models and ways does not suffice anymore. We need ideas, new and old.’ It is only together that we can establish the strengths of European culture in all its complexity. We curated a selection of the most inspiring ideas from, among others, György Konrád, Chantal Mouffe, Arnon Grunberg, Rüdiger Safranski, Wende, Ulrich Seidl, Marjolijn van Heemstra, Philipp Blom, Benjamin Barber, Claudy Jongstra, Rem Koolhaas, Ivo van Hove, Marlene Dumas, Milo Rau, Slavenka Drakulic, Tom Holland, Jan Dibbets and Phillip Blond. These visions, thoughts and statements, presented in various forms – ranging from performances and plays to film screenings and lectures- can be found in the report. 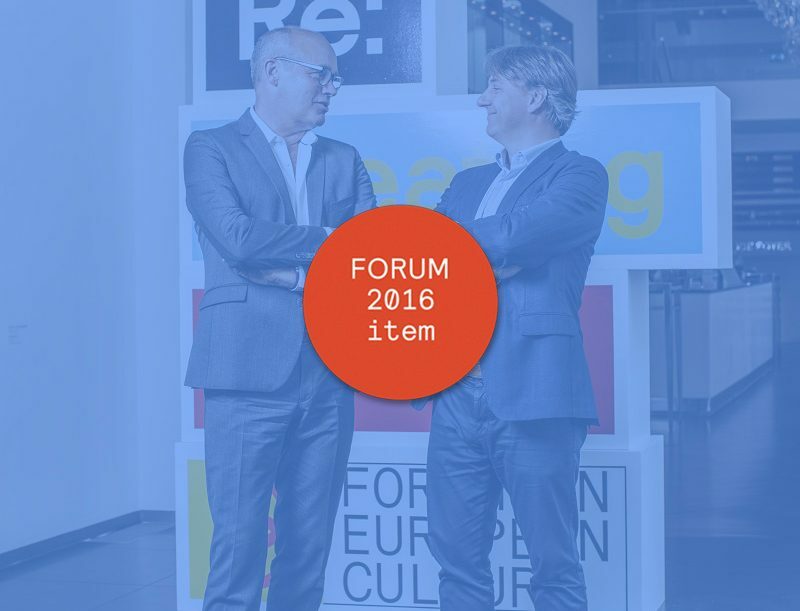 We are looking back on a great first edition of the Forum on European Culture. We need to continue this dialogue the upcoming years to secure our shared European future. We would like to extend our sincere gratitude to all our partners, contributors and of course the audience for their enthusiasm and support. Without them this forum would never have been possible.